With a stay at FriendHouse Apartments - Old Town in Krakow, you'll be within a 15-minute walk of Old Synagogue and Galicia Jewish Museum. Featured amenities include multilingual staff, ATM/banking services, and an elevator (lift). A roundtrip airport shuttle is provided for a surcharge (available 24 hours). With a stay at Mojito Apartments - Angel Wings in Wroclaw, you'll be within a 10-minute drive of Wroclaw Cathedral and Wroclaw University. Self parking (subject to charges) is available onsite. Located in Poronin, Bajkowa Chata is within a 10-minute drive of Jaszczurowka Chapel and Nosal Ski Center. Free self parking is available onsite. 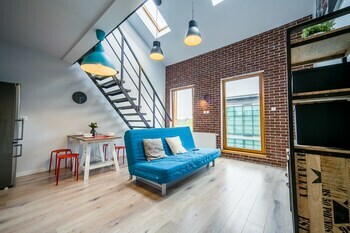 Located in Warsaw (Wola), this apartment is within a 10-minute drive of Lazienki Park and Warsaw Uprising Museum. Located in Warsaw (Srodmiescie), Apartament Dream Loft ONZ is within a 10-minute drive of Royal Castle and Grand Theatre. The front desk is staffed during limited hours. When you stay at Hotel Alpejski in Polanica-Zdroj, you'll be in the mountains, within a 5-minute drive of Teatr Zdrojowy and Park Szachowy. Free self parking is available onsite. With a stay at Cracow Stay Apartments, you'll be centrally located in Debniki, convenient to ICE Krakow Congress Centre and Wawel Castle. A stay at Anchor House places you in the heart of Sopot, within a 5-minute walk of Sopot Beach and Museum of Sopot. With a stay at this apartment in Sopot (Dolny Sopot), you'll be a 5-minute walk from Atelier Theatre and 5 minutes by foot from Dom Zdrojowy.